Multiple sclerosis (MS) is a so-called autoimmune neurological disease and is associated with a dysregulation of the patient’s immune system. It particularly affects young adults, in whom it is the main medical cause of physical disability. There are more than 2 million people with MS worldwide. MS is categorised as a “chronic demyelinating autoimmune disease of the central nervous system (CNS).” It causes the degradation or destruction of the myelin sheath that surround the nerve cells of the CNS, which consists of the brain and spinal cord. This sheath is necessary for the transfer of information between different neurons or between the CNS and cells in the periphery, for example muscle cells. 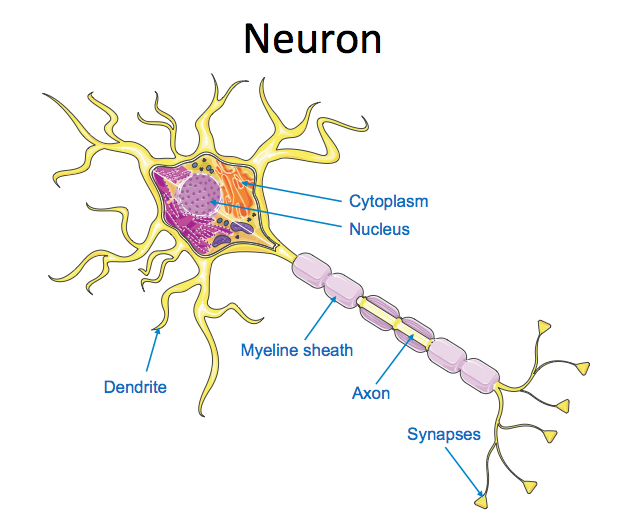 Thus, if the myelin sheath is damaged or destroyed, as is the case in MS, the propagation of messages between the neurons and other cells becomes less efficient and ultimately a neurological function such as walking, balance or the sense of touch or sight may become impaired. Under microscope or in anatomical sections, the damaged myelin sheath shows hardened patches (scleroses), from which comes the name of the disease. While the precise causes of the disease remain unknown, complex genetic factors and also environmental factors such as geographical location (MS occurs more frequently in the northern regions of the Northern Hemisphere and in the southern regions of Southern Hemisphere) as well as some viral infections are often put forward as potential triggers. In multiple sclerosis, the patient’s immune system does not recognize the body’s own myelin and thus commands some of its white blood cells (the lymphocytes) to destroy it. The lymphocytes are the cells that under normal conditions fight against infectious viruses and bacteria and destroy foreign bodies that have entered into the body. This inappropriate activation of the immune system can thus trigger the destruction of myelin and cause inflammation of the nervous system, which worsens the patient’s condition. This activation has numerous consequences for the patient. They include motor disorders that manifest in particular as muscle weakness or stiffness, which can be accompanied by problems with coordination or balance. People with MS also frequently report sensory disorders in the form of pins and needles, numbness, sensations of electric shock or difficulties in recognizing warmth and coldness. These sensory disorders can also result in pain. Visual disorders due to the optic nerve being affected are present in one third of patients. A decrease in visual acuity may occur rapidly and be accompanied by pain during eye movements. There are two large categories of multiple sclerosis: on the one hand, the relapsing-remitting form, and on the other, the progressive forms of multiple sclerosis (which are subdivided into primary progressive and secondary progressive forms). Relapsing-remitting multiple sclerosis is the most common form of the disease, accounting for 65% of all cases of MS. This form manifests as “relapses”, acute episodes during which the patient has neurological symptoms such as a lack of strength or coordination, problems with walking, abnormal sensations or visual disturbances. After a few days or a few weeks, these symptoms regress partially or totally. The patient’s condition remains stable until the next relapse, which may often occur unpredictably after a few months or a few years. With time, the disability of a patient with relapsing-remitting MS worsens in a “stepwise” manner. The progressive forms of MS are distinguished from the relapsing-remitting form by the fact that symptoms worsen even outside of relapses. This form most commonly appears in a patient after several years of relapsing-remitting MS, thus it is referred to as the secondary progressive form. These patients may continue to have relapses, but neurological symptoms worsen in a continuous manner and the relapses generally become increasingly rare. More rarely, a patient may present with progressive MS without ever having been affected with relapsing-remitting MS; this is the primary progressive form. 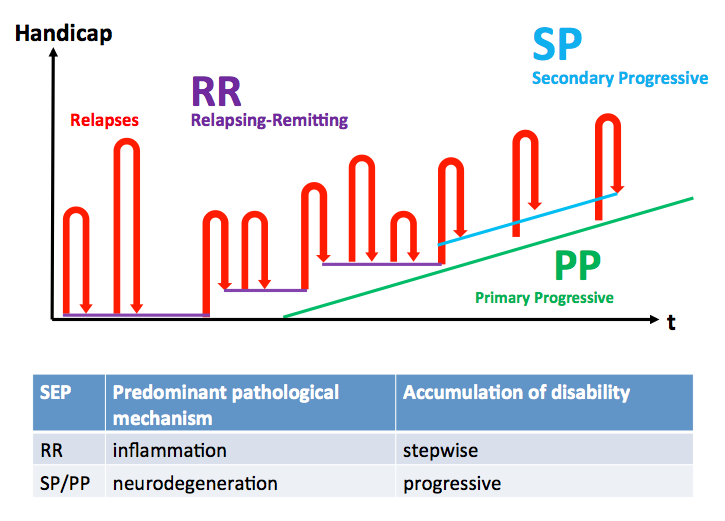 As with the relapsing-remitting form, the course of the disease over time is often difficult to predict: some patients will have long periods of relative stability or of minimal worsening of symptoms, while others will see a rapid deterioration that will make it impossible to continue working or to live an independent life. Almost a dozen substances are currently used to treat multiple sclerosis, but these mainly target the relapsing-remitting forms. The majority of them interact with the immune system so as to control the inflammation of the central nervous system and prevent the destruction of myelin. What limits their use most of all is the fact that these treatments can sometimes weaken the immune system and make the body more vulnerable to germs such as viruses or bacteria. Virtually all these treatments are effective in reducing the number and/or severity of relapses. The most recent ones may also be effective in decreasing disability over the long term. Unfortunately, even the treatments that are most effective in the relapsing-remitting forms have not had the same success in the secondary progressive forms and no treatment is currently acknowledged as effective in the primary progressive forms. It has been assumed for many years that certain viruses could play a part in the initiation and development of multiple sclerosis. One of the viruses in question is MSRV, the name of which means “Multiple Sclerosis-associated Retrovirus”. Millions of years ago, this virus was able to copy itself into our DNA, the genetic inheritance transmitted by parents. Today, this virus is therefore present in each of us in a latent and innocuous form. It appears that MRSV is activated by various mechanisms in patients with MS, thus becoming transformed into an active and virulent virus that induces the pathological phenomena of MS mentioned above: inflammation of the central nervous system, degradation of the myelin sheath and neurodegeneration due to cell death. Researchers at GeNeuro have succeeded in developing an antibody that binds to activated MSRV in order to neutralise it. This is a completely novel therapeutic approach that, in contrast to existing treatments, does not interact with the functions of the immune system and may enable the treatment of all forms of MS, relapsing-remitting and progressive, with fewer side effects. In March 2018, GeNeuro and Servier announced successful 12-month results in neuroprotection for a Phase 2b study with a drug candidate in Multiple Sclerosis.